(Nanowerk News) Microfluidic devices are used in a variety of life science applications but, because they are typically disposed of after a single use to avoid cross-contamination, finding a cost-effective, high-throughput method for their mass-production is vital. Now, Lip Pin Yeo from the Singapore Institute of Manufacturing Technology of A*STAR and co-workers have completed a feasibility study of the ‘hot roller embossing technique’— a method to fabricate polymer-based microfluidic chips ("Investigation of hot roller embossing for microfluidic devices"). Microfluidics are typically based on either silicon, glasses or polymers. According to Yeo, approaches based on silicon or glass are costly because the raw materials and associated manufacturing costs are expensive. Polymers, however, are widely available at low cost and are easy to process. 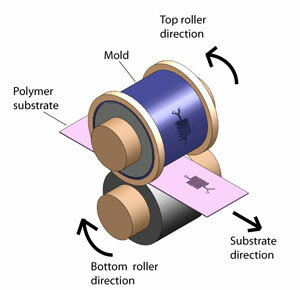 Commenting on the choice of fabrication method, Yeo says: “The setup cost of a roller embossing facility is much lower compared to conventional silicon and glass microfabrication facilities.” The technique is analogous to gravure printing. Two rollers are used to imprint the required pattern of microchannels on a polymer substrate that is sandwiched between them (Fig. 1). While it is a simple method conceptually, the fidelity of the mold-to-substrate pattern transfer is strongly dependent on a multitude of process parameters, making the search for the optimum regime of operation tedious. Yeo and co-workers tackled this problem using a design-of-experiment (DOE) method, a statistical framework that is able to predict the optimal design from only a limited number of experimental runs. The variable ‘input’ parameters in the DOE were the substrate preheat temperature, the embossing-roller temperature and the pressure applied during embossing. The output parameter to be optimized was the normalized embossing depth—the ratio between the depth of the polymer microchannel and the height of the mold protrusion—where a value of 1 signifies a perfect mold-to-pattern transfer. The researchers conducted experimental runs with different input parameters and used the DOE method to elucidate the optimal operating regime yielding the best mold-to-pattern transfer, which they then verified by test experiments. “By operating the roller embossing process using the optimal conditions, an averaged normalized embossing depth of 0.85 can be achieved for low pattern-density mold designs,” explains Yeo. The ratio of 0.85 is in close agreement with the value predicted by the DOE. Functional testing of fluid flow and mixing of the optimally fabricated microfluidic devices also yielded encouraging results. However, the method will benefit from further improvement. “The crucial issues will be to maintain uniform temperature and pressure distribution during the embossing process,” says Yeo.